I specialize in both seamless and classic mokume bands. 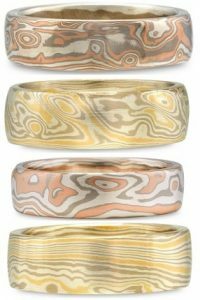 Seamless mokume bands have patterns that flow uninterrupted around the entire ring. I’ve developed new methods for constructing and patterning seamless mokume bands which allows me to offer unique patterns. I also carry a variety of classic woodgrain pattern mokume bands. 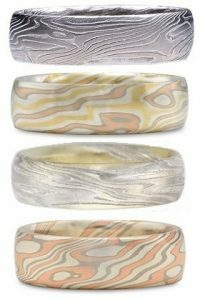 All my mokume bands are made from scratch starting with sheets which are diffusion bonded, patterned and formed into bands. All metals used in my bands are precious metals, hypoallergenic and tarnish resistant. I offer metal combinations with 14k palladium white gold, 950 palladium, 500 palladium, 14k red gold, 18k yellow gold and palladium enhanced sterling. Metals are chosen for color contrast and durability. They won’t cause staining and are wear resistant. I work harden bands by stretching and compressing bands, to maximize durability.